Over the last 30 years, dental implants have grown to be an effective and reliable means of replacing missing teeth and securing bridges and dentures. Fixed-removable denture attached to 6 Calcitek dental implants, surgery performed by Dr. Frank L. Pavel, Jr, San Diego. 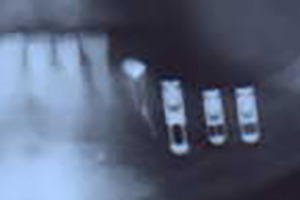 Metal-ceramic bridge attached to 3 IMZ dental implants, surgery performed by Dr. Al Cutri, San Diego. Metal-ceramic crown cemented to an AstraTech dental implant, surgery performed by Dr. Rick Yamada, La Jolla. Metal-ceramic bridge cemented to 4 AstraTech dental implants, surgery performed by Dr. Rick Yamada, La Jolla. Metal-ceramic crown cemented to an Frialit dental implant, surgery performed by Dr. Rick Yamada, La Jolla. Metal-ceramic crown cemented to an ITI dental implant, surgery performed by Dr. Allen Moffson (Periodontics), Solana Beach. Metal-ceramic crowns cemented to 2 ITI dental implants, surgery performed by Dr. Frank L. Pavel, Jr, San Diego. Metal-ceramic crowns cemented to 3 AstraTech dental implants, surgery performed by Dr. Rick Yamada, La Jolla. A metal-ceramic crown cemented to an ITI dental implant, surgery performed by Dr. Susan Nguyen (Periodontics), San Diego. Two ceramic crowns cemented to two OsseoSpeed AstraTech implants utilizing custom ceramic abutments, surgery performed by Dr. Rick Yamada, La Jolla. Full denture anchored by 2 Denar dental implants, surgery performed by Dr. Roger Kingston, San Diego. Partial denture anchored by a single Calcitek dental implant, surgery performed by Dr. Frank L. Pavel, Jr, San Diego. Upper full denture anchored to 3 Calcitek dental implants, surgery performed by Dr. Al Cutri, San Diego. Lower full denture anchored to 3 IMZ dental implants, surgery performed by Dr. Al Cutri, San Diego. Full lower denture anchored by 2 AstraTech dental implants, surgery performed By Dr. Andrew Chang, San Diego. Full upper denture anchored by 6 Calcitek dental implants, surgery performed by Dr. Frank L. Pavel, Jr, San Diego. Full upper denture anchored by 6 Zimmer dental implants, surgery performed by Dr. Frank L. Pavel, Jr, San Diego. Losing a tooth here and there not only induces pain, but it also reduces a person’s confidence in his or her appearance. While many live a lifetime without repair, many are finding that dental implants by Dr. Wong can change the way they live. Improve not only your image but also the confident manner in which you carry yourself with reconstructive or cosmetic dentistry work as detailed throughout Smile-DDS.com. An implant can secure bridgework and dentures, as well as work as a means to restore missing teeth. Our goal is to bring rich smiles to the forefront. Pearly whites allow patients to embrace the world around them with a confident air once again.